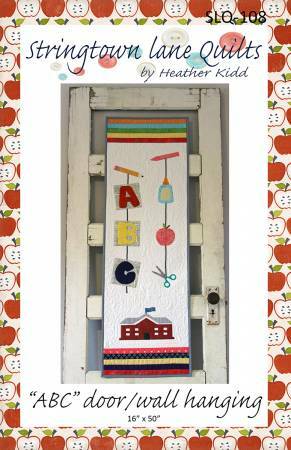 ABC Door/Wall Hanging by Heather Kidd measures 16" x 50". 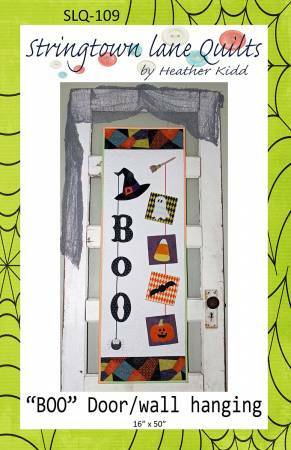 Boo Wall Hanging by Heather Kidd measures 16" x 50". Cactus Expert by Bloomin' Minds measures 17" x 13.75". Cest La Vie by Meags & Me measures 40" x 40". 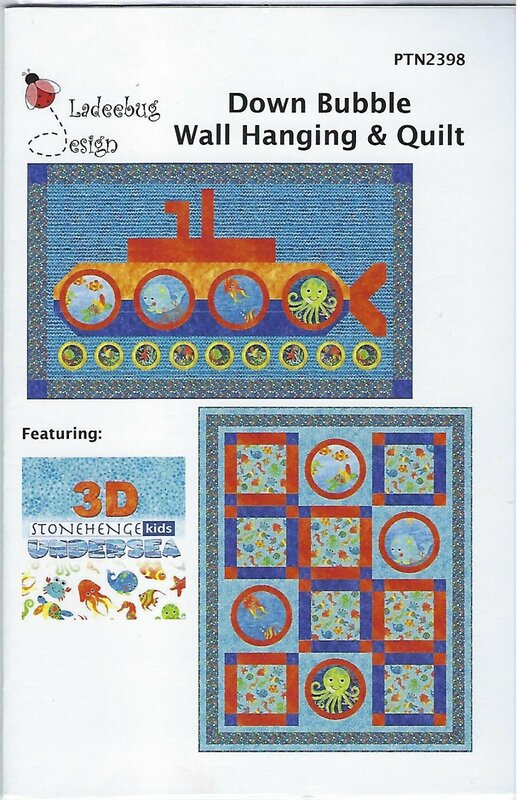 Down Bubble Wall Hanging & Quilt from Pine Tree Country Quilts measure 62" x 38" and 44" x 56" and use the Stonehenge Kids 3D Undersea collection by Northcott. Evergreen by Deb Eggers from The Cottage Rose measures 25" x 29" and 18" x 23". Evergreen Panel Batik from Applique Elementz measures 16" x 25". 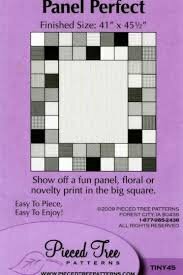 Fusible fabric applique for fabric crafts and more. 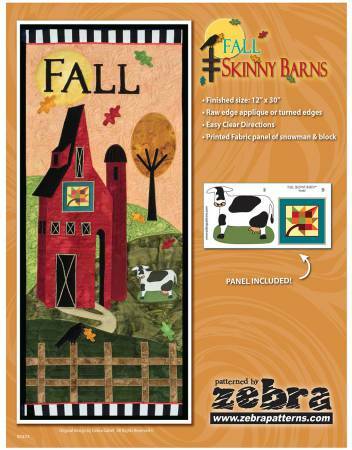 Fall Skinny Barns from Zebra Patterns. Measures 12" x 30". 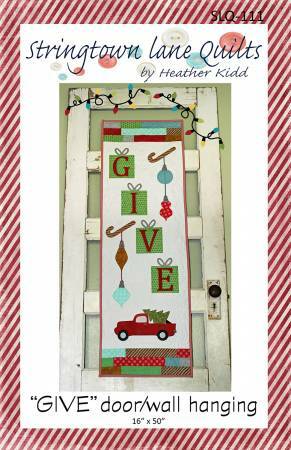 Full instructions on how to create your applique seasonal hanging. This pattern is one in a series of four. Included is a mini panel of the quilt block that is on the barn. 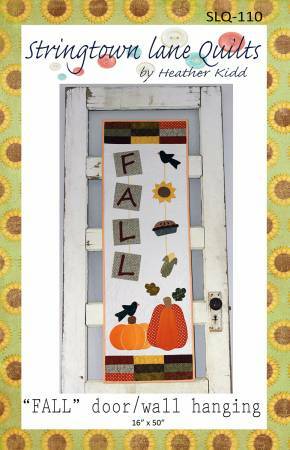 Fall Wall Hanging by Heather Kidd measures 16" x 50". Fantasy Blossoms from Cherry Blossoms Quilting Studio measures 35" x 63". 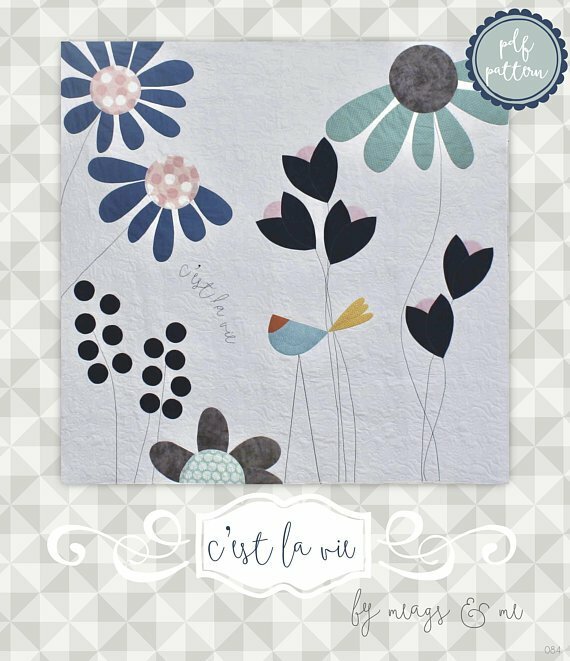 Give Wall Hanging by Heather Kidd measures 16" x 50". 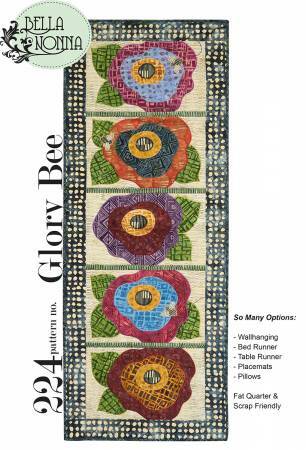 Glory Bee Quilt Pattern from Bella Nonna. 224 pattern no. So many options: wallhanging, bed runner, table runner, placemats, pillows. 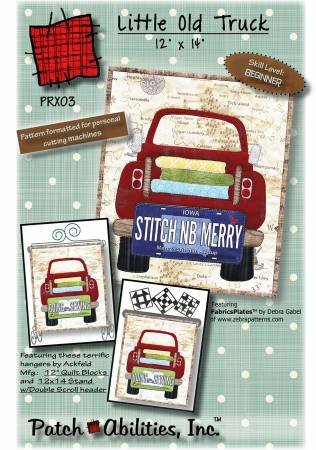 Fat quarter and scrap friendly. 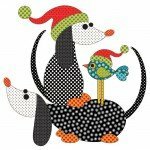 Gobble Gobble Dotz from Applique Elementz measures 9.25" x 9". Fusible fabric applique for fabric crafts and more. Home Cinema by PatchAbilities Inc. measures 6.5" x 28". Howl-lelujah from Applique Elements measures 20" x 28.5". 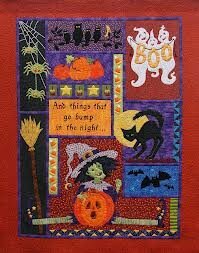 Fusible fabric applique for fabric, crafts, and more. I'm Knot from Bloomin' Minds measures 14.5" x 13.5". Little Old Truck from Patch Abilities Inc. measures 12in x 14in. Can be made with cotton or wool. New Summer 2017 Row by Row. Matching Socks from Bloomin' Minds Half to Have measures 13.5" x 17". Mini Medallion from Sew Kind of Wonderful measures 28" x 32". Mini Twist from Sew Kind of Wonderful measures 27" x 36". 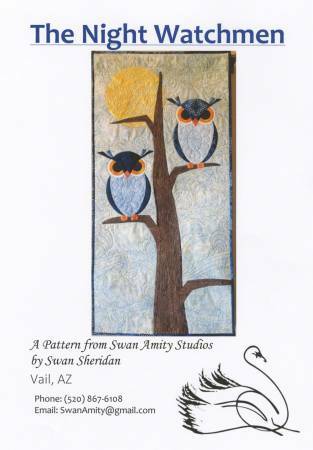 Night Watchmen by Swan Sheridan from Swan Amity Studios measures 21" x 43". On The Go from Patch Abilities Inc. measures 22in x 36in. 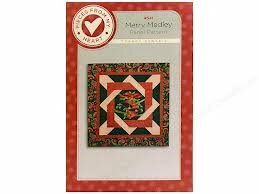 Romance by Amanda Murphy is a fat quarter friendly pattern. 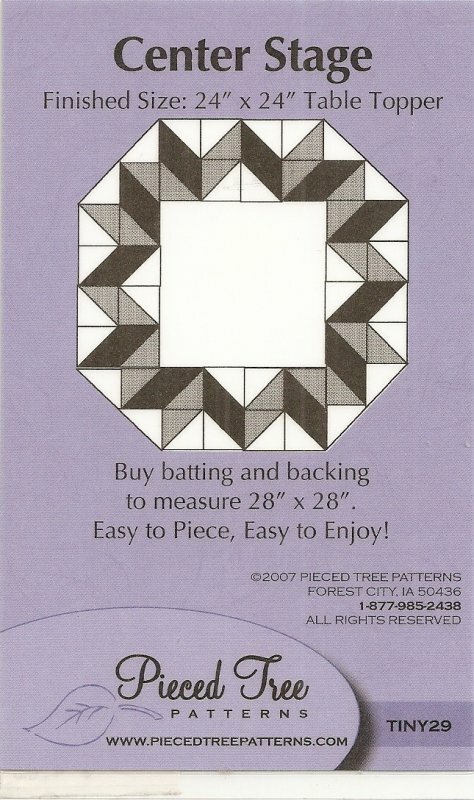 An elegant 22in diameter table topper. Rose Garden from Pieces From My Heart measures 56" x 56" and features Rambling Rose fabric from Moda. 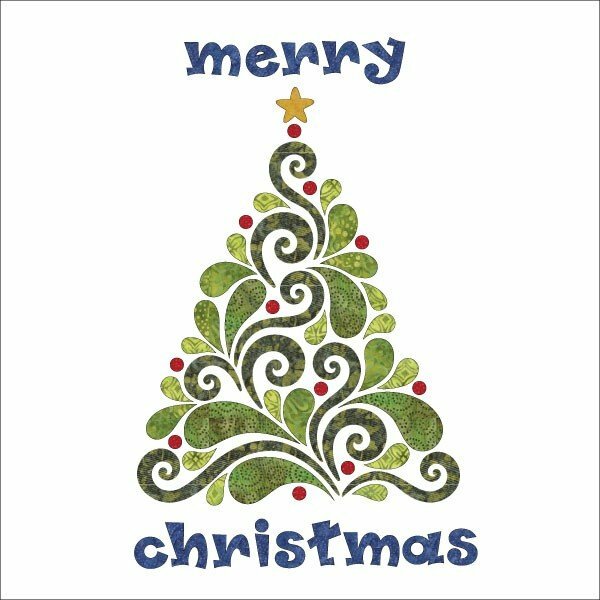 Santa Babies from Applique Elementz measures 14.5" x 14.25". 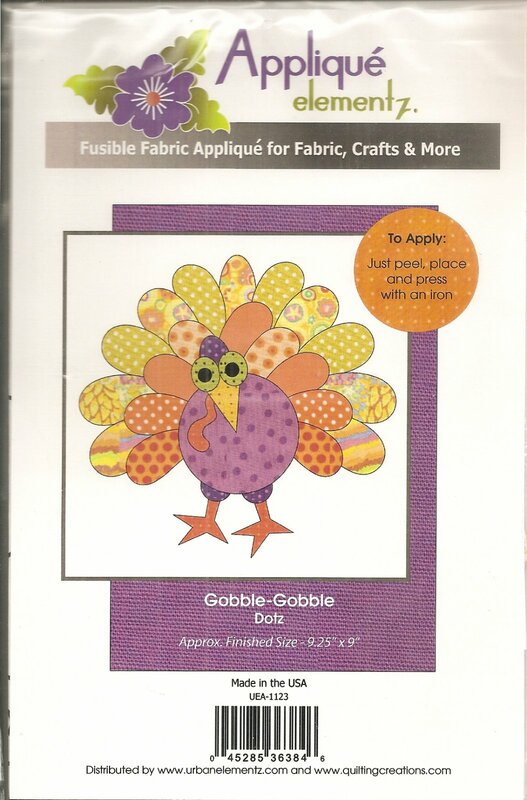 Fusible fabric applique for fabric, crafts & more. 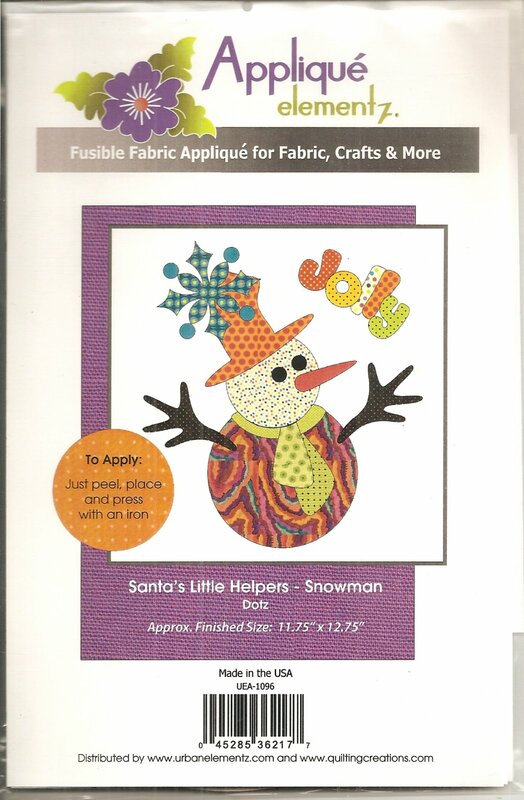 Santa's Little Helpers Snowman Dotz from Applique Elementz measures 11.75" x 12.75". Fusible fabric applique for fabric crafts and more. 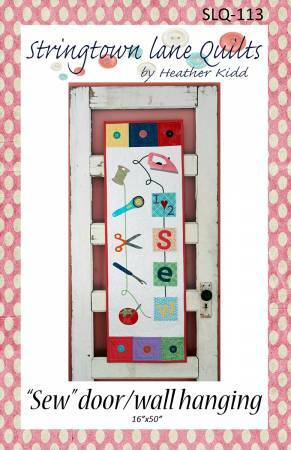 Sew Wall Hanging by Heather Kidd measures 16" x 50". Spaceman from Villa Rosa Designs measures approx. 45" x 63". 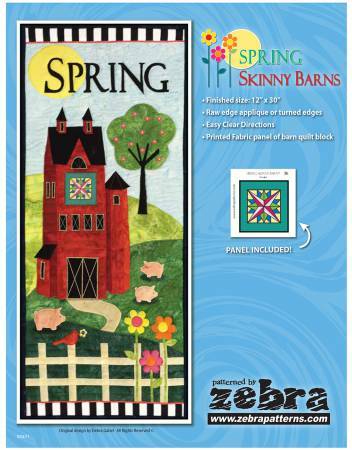 Spring Skinny Barns from Zebra Patterns. Measures 12" x 30". Full instructions on how to create your applique seasonal hanging. This pattern is one in a series of four. Included is a mini panel of the quilt block that is on the barn. Stained Glass from Pieces From My Heart measures 38" x 38" and features Rambling Rose Charm Pack from Moda. Stand Guard by Basicgrey, Inc. measures 16" x 52.5". 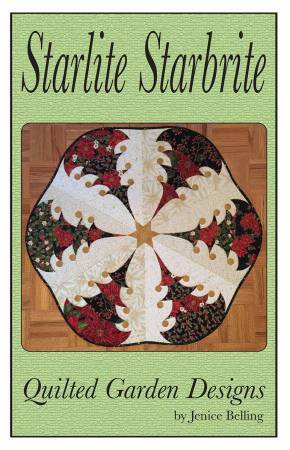 Starlite Starbrite by Jenice Belling for Quilted Garden Designs measures 38" diameter. 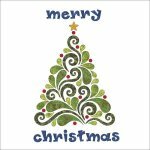 Create this beautiful table topper or tree skirt to accent your holiday decor. Appli-quilt (quilting and applique completed together) makes this a quick project. 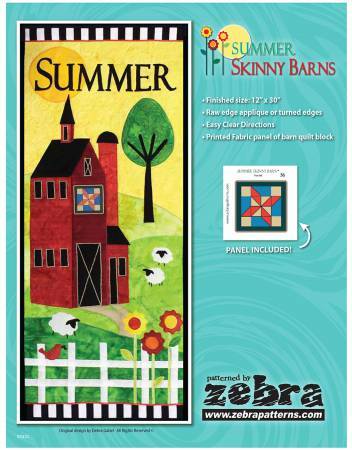 Summer Skinny Barns from Zebra Patterns. Measures 12" x 30". Full instructions on how to create your applique seasonal hanging. This pattern is one in a series of four. Included is a mini quilt block that is on the barn. The Promise Ring from Cut Loose Press measures 32" x 37". The Understudy from Pieced Tree Patterns measures 16" x 16". Can be used as a table topper or placemat. 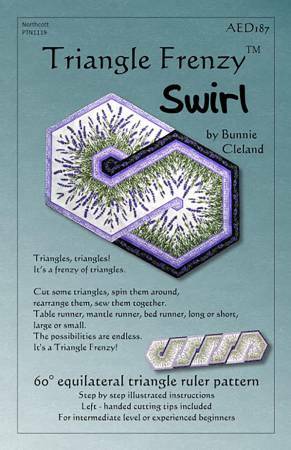 Triangle Frenzy Swirl by Bunnie Cleland for Artistically Engineered Designs. Uses the CGRT12560 ruler from creative grids. 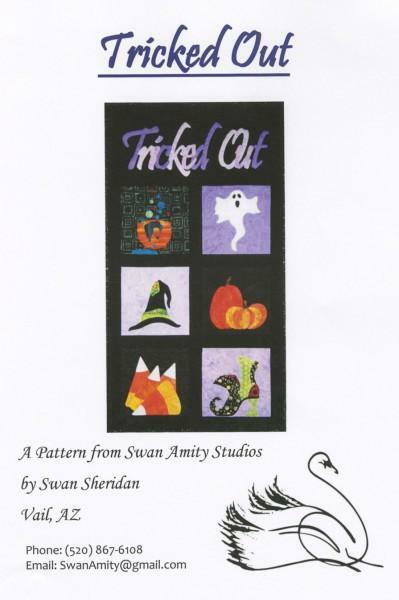 Tricked Out by Swan Sheridan for Swan Amity Studios measures 26" x 48". Welcome Fabric from The Wooden Bear measures 17" x 23". 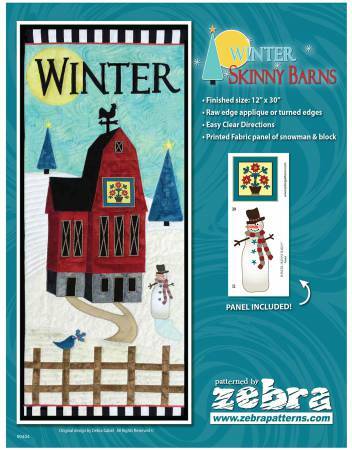 Winter Skinny Barns from Zebra Patterns. Measures 12" x 30". Full instructions on how to create your applique seasonal hanging. This pattern is one in a series of four. Included is a mini panel of the quilt block that is on the barn. Arizona Cactus from Judy Niemeyer measures 42" X 42". 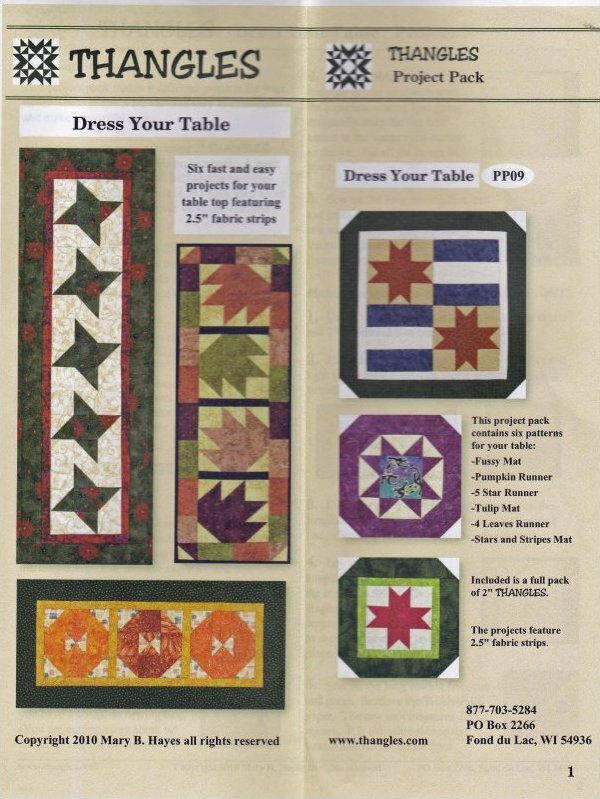 'Dress your Table' is a Thangles pattern for 6 fast and easy projects for your table top featuring 2.5" strips. Thangles included. Flatbread by Modern Quilt Relish uses valued rectangular shapes to serve up a distinctive crunch. Add the condiment of your choice for depth of flavor.Makes a throw queen or a table runner. 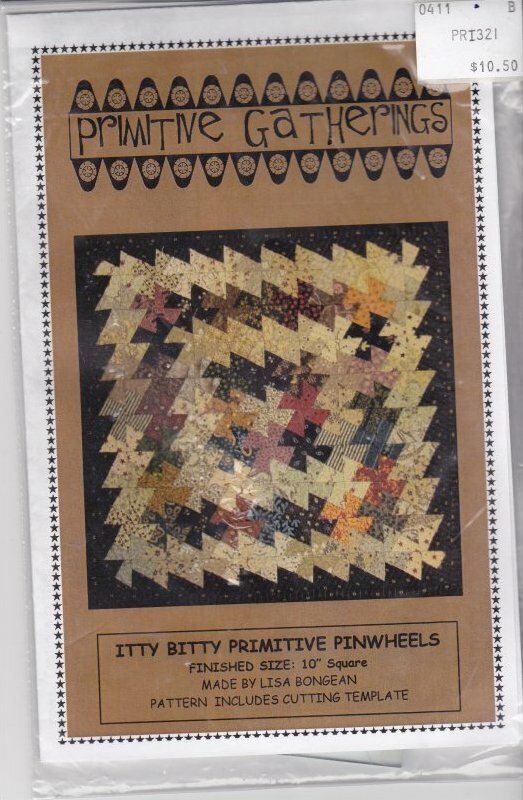 This pattern 'Itty Bitty Primitive Pinwheels' is by Lisa Bongean. 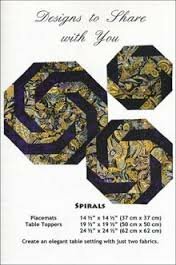 'Mock Pineapple' is a pattern of 3 different designs by Time to Quilt. It includes a table runner table topper and wall hanging. It goes together like a 9 patch. 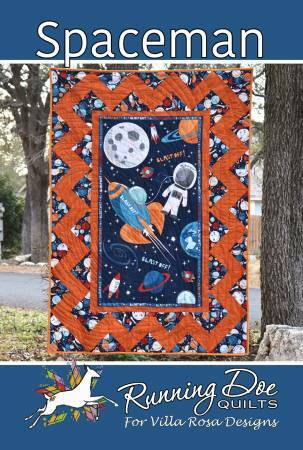 'Panel Magic' is a small quilt pattern by Pieced Tree. It is made using a panel and measures 34 1/2" X 54". 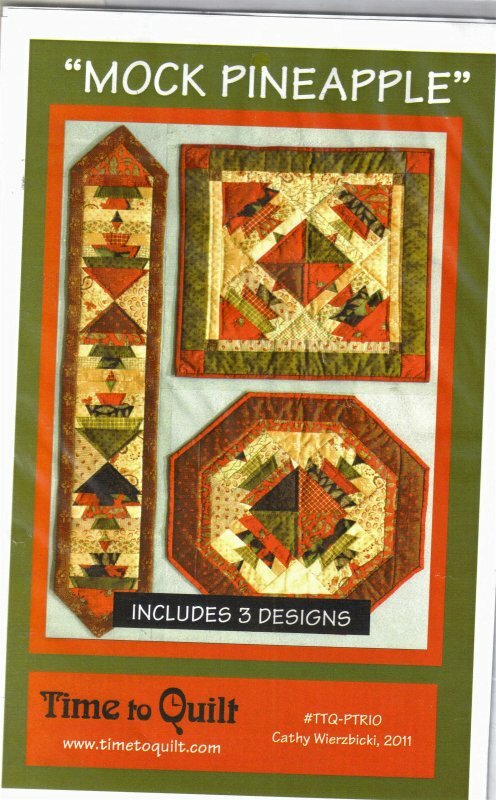 This pattern 'Spirals' makes placemats and 2 sizes of table toppers. Create an elegant table setting with 2 fabrics.